Broadway, the 13-mile road that began as an Indian trail and grew to define the city, is synonymous with greatness. 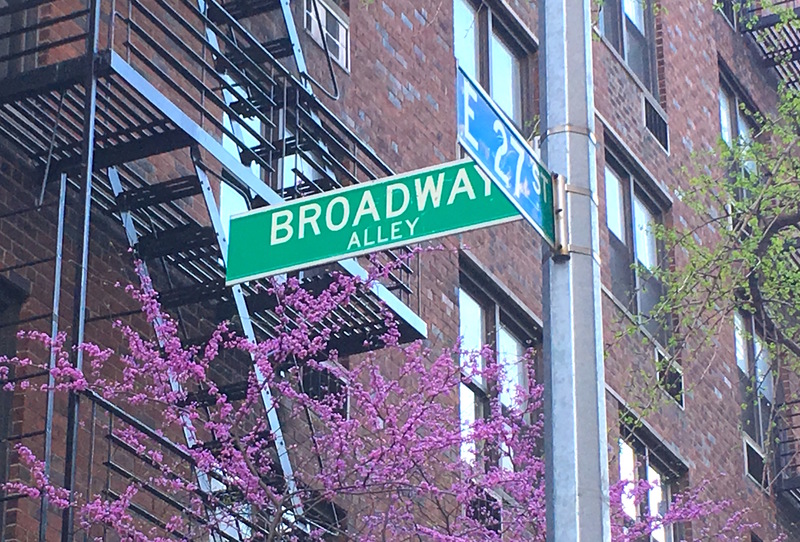 To put “Broadway” in the name of a new street is to aspire to something big — which was the idea behind East Broadway and West Broadway. City fathers in the 19th century gave these names to existing streets in Lower Manhattan to divert traffic from the real Broadway and create what they hoped would be successful thoroughfares, states The Street Book. 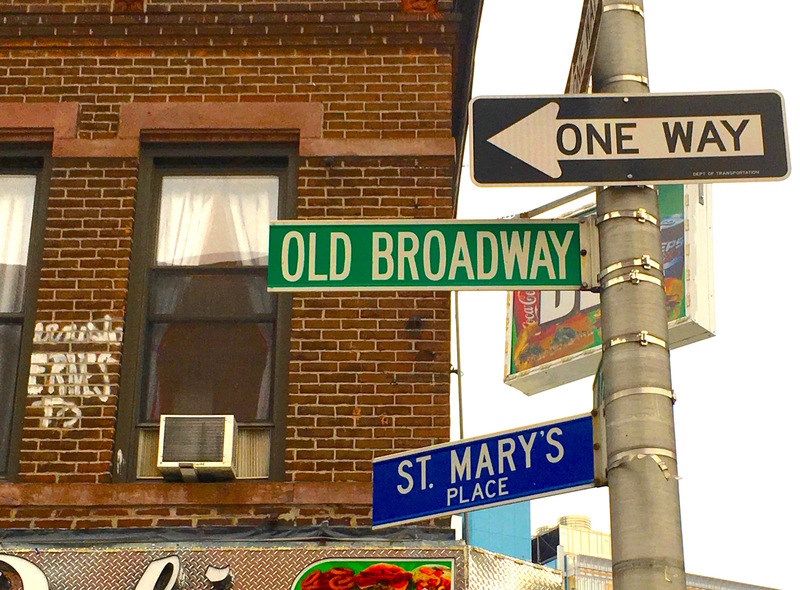 So how do you explain Old Broadway and Broadway Alley, two narrow byways all but forgotten by the early 20th century? Old Broadway is actually a leftover piece of another street. 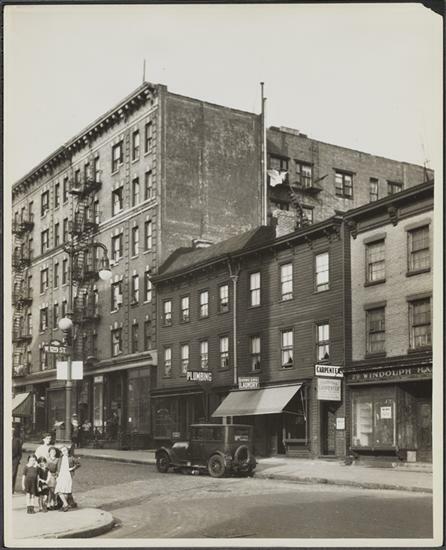 This lane runs from 125th Street to 129th Street (at left in 1932) just east of the real Broadway, then picks up again between 131st and 133th Streets (below, also 1932). It’s a vestige of the old Bloomingdale Road, a colonial-era road that started around Madison Square and crossed to today’s Upper West Side. In the late 19th century, Bloomingdale Road was straightened and made part of the real Broadway. The remaining seven blocks of Bloomingdale Road didn’t fit anywhere, so it was given the moniker Old Broadway and allowed to remain on the map. 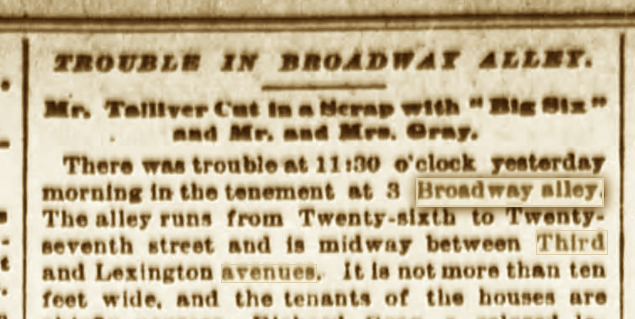 “Why the few blocks of Old Broadway were left no one knows exactly, but probably because the wiping out of the thoroughfare, with many of its old houses, would have entailed unnecessary hardship upon the residents,” explains a 1912 New York Times article. Vestiges of rural Manhattan remained through the 1930s. “For nearly a block, on the west, huge signs hide a bit of raised, rocky ground — pasture, no doubt, for goats in days gone by,” states another Times piece from 1930. Today, the only reminder of a bygone city is the Old Broadway Synagogue (on the left side of the above photo), built in 1922 for Harlem’s Jewish population. Broadway Alley has a more colorful past. 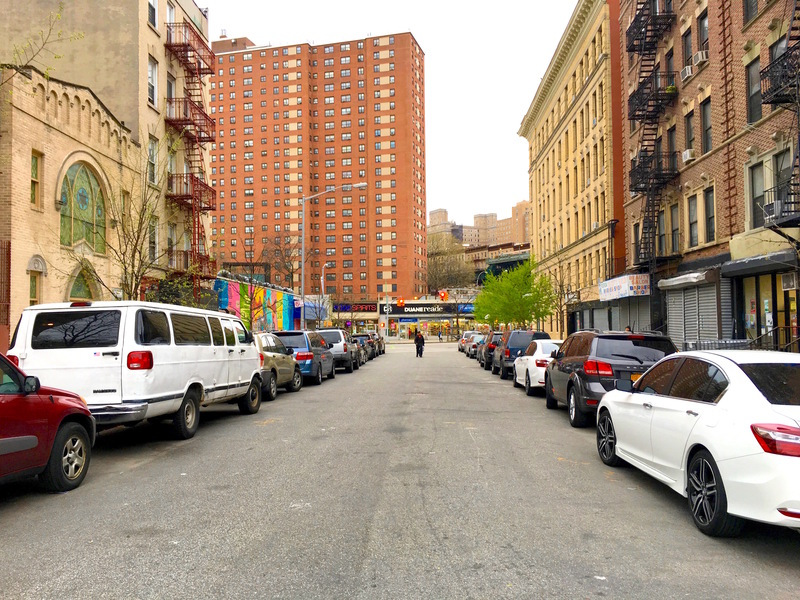 It’s a one-lane drive between 26th and 27th Streets and Lexington and Third Avenue with a street sign on the 27th Street side. 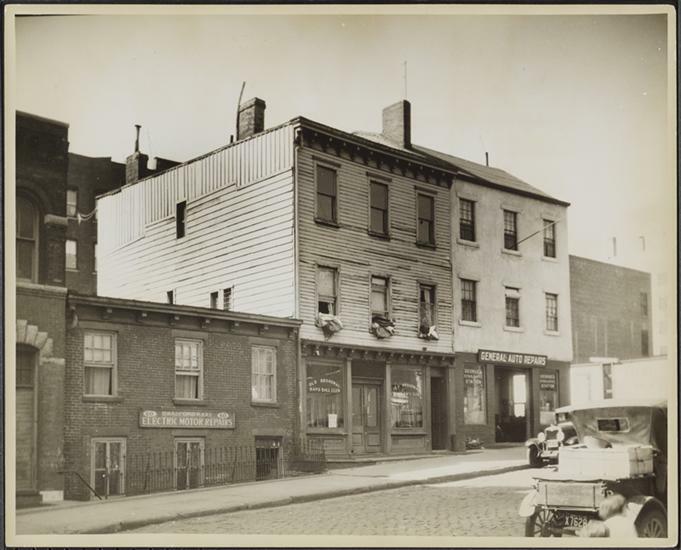 Laid out around 1830, according to a 2005 Times article, the street was given its name at some point by owners who hoped to associate it with the glamour of Broadway theater. 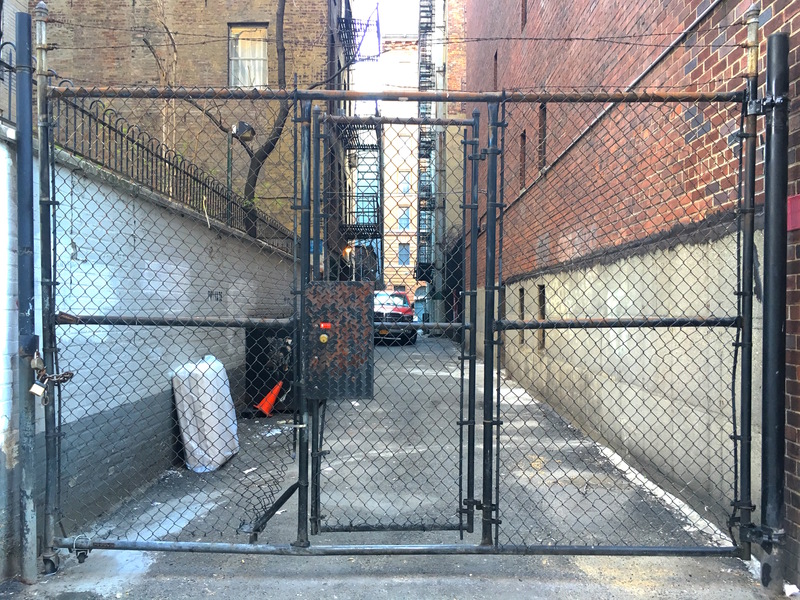 For much of the 19th century, it was actually associated with crime and poverty; the alley was home to narrow tenements where residents had a fondness for gambling and drinking. Rumor has it that Ringling Brothers once kept their circus elephants here — hopefully when it was a dirt drive not littered with debris behind wire and iron fencing, as it is today (at left), from the 26th Street end). Broadway Alley is mostly covered in asphalt now, but it was once considered one of the last unpaved roads in the city. 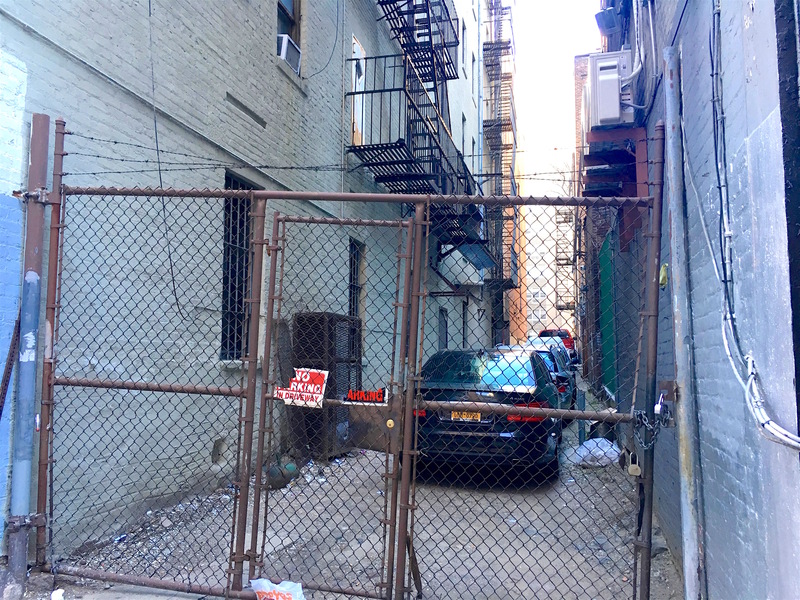 Though maybe it doesn’t technically count, since Broadway Alley is privately owned and only one occupied building uses the street address, according to the Times.